Boxing and coffee are not what you would call a natural combination. However, this hasn’t stopped professional boxer Marcus Eaton from going against the grain with his friend and business partner Andy Pollard and launching Queensbury Coffee House, which has opened up inside Barker and Stonehouse in Old Shoreham Road. Named after the Queensberry Rules – a code of generally accepted rules in the sport – the café works hard to add a little more to your standard furniture store. As perhaps is expected, the décor is reflective of its surroundings, impeccably styled in luxuriant tones, walls adorned with fern-printed paper and greenery hanging from the ceiling. But what comes as more of a surprise – and what is immediately clear – is the thought and care that has clearly gone into the food and drink: the coffee, a blend created exclusively by Railtown Coffee Ltd; the teas coming courtesy of premium Brighton company Hoogly Tea; the cakes provided with love by local bakers Coburn & Baker. There’s even plenty of vegan and gluten free options on the menu. There’s four of us when we pay a visit, and we’re all a bit taken with the choice on offer. The display counter alone boasts rows of flatbreads, sandwiches, sausage rolls, layer cakes and a number of traybakes – and that’s before you even glance at the waffle menu (which are topped with Gelato Gusto ice cream). I choose a vegan flatbread (laden with a generous helping of sundried tomatoes and olives) and an Earl Grey tea with lemon, while the others make their orders. Before long, our table is filled with plates – a warming selection of carbs and caffeine perhaps unbefitting for a January diet, but perfect for a lazy Saturday afternoon. Two more flatbreads (resembling delicious mini-pizzas), a salt beef sandwich, a vegan chocolate and nut bar (which tastes remarkably like Rocky Road. Yum) and two plates of waffles – one strawberry and another with banana and chocolate – arrive, with little room to breathe. There are also a few coffees around the table too, with a percentage of their sales going to The Abode Project, a charity that builds schools and housing in Uganda. For the four of us, it’s more than enough. 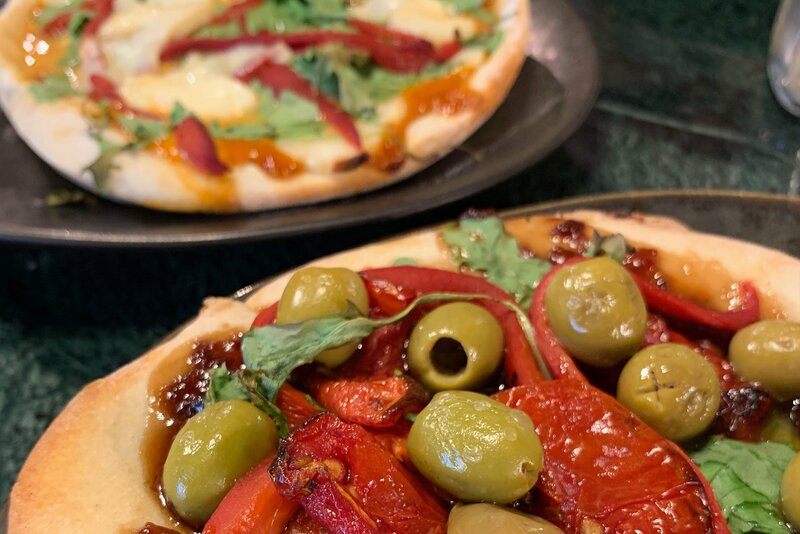 The flatbreads are warm and flavourful, though the meatier ones I’m told have a bit of a chilli kick – so worth considering for those who can’t tolerate heat. In fact, most of the food is excellent – and we’re impressed with the level of accessibility for all. 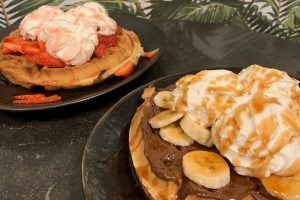 Perhaps it was that they were left to get cold, but we did find the waffles erred slightly on the stale side – however the toppings were plentiful and a real treat for sweet lovers. Four hungry bellies were amply filled with our visit at the Queensbury, and we left incredibly satisfied – though it must be said it was difficult not to take a nap on the Barker & Stonehouse beds as we left. 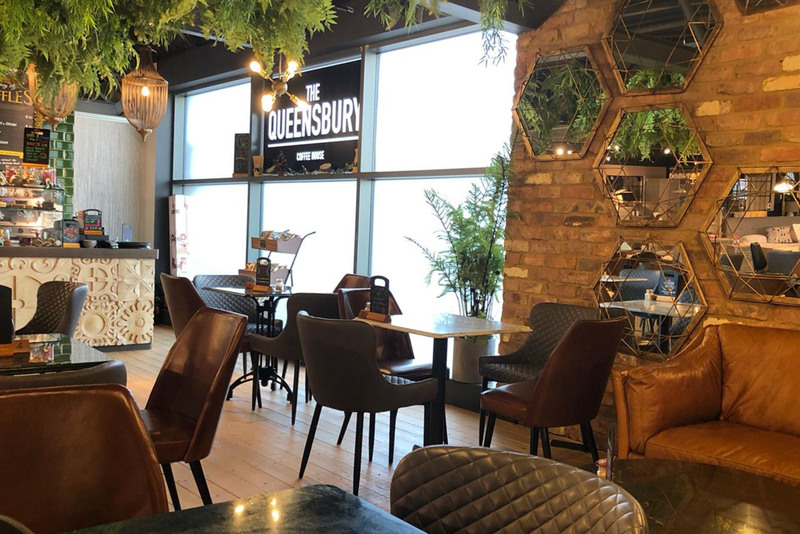 I personally can’t help but think the Queensbury’s efforts are a little lost inside a furniture store (however excellent that store may be), as the food speaks for itself and could very easily survive on the high street. But if you close your eyes mid-mouthful, letting their artisanal flavours overcome you, you might – MIGHT – just forget where you are.